39 minutes, 42 seconds . 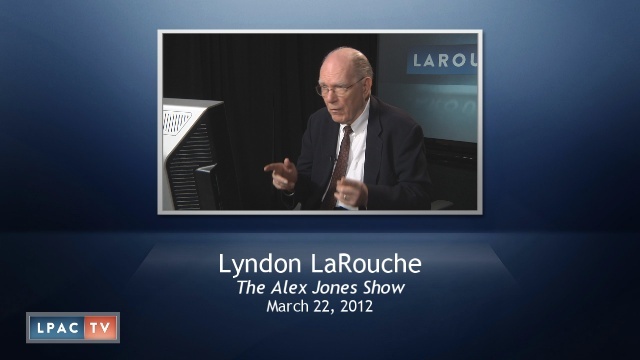 Lyndon LaRouche was the guest on the Alex Jones show March 22nd, the focus of which was the imminent threat of an out-break of thermonuclear war. It was late summer 1977, when a crazed President Carter, under the control of Zbigniew Brzezinski, threatened to detonate a World War III confrontation against the Soviet Union, that Lyndon LaRouche developed the conception of the Strategic Defense Initiative, a policy for Mutually Assured Survival through the application of new physical principles which would serve, simultaneously, as a driver for immediate war avoidance, and a new scientific-industrial revolution toward addressing the common aims of mankind. As LaRouche expressed it in his latest strategic paper, "Our World's Fast-Waning Options," "unless you understand that single fact, stretched from late Summer 1977, to the present days, you do not understand the trajectory of the military or related history of the world over an interval since the beginning of those intervals of time, the history which currently threatens you, still today, with a repose in Hell, unless you intervene to deserve better, in an appropriately timely manner now." Indeed, the intention with which LaRouche acted over that entire period, still holds the key to defeating the British imperial enemy which killed the SDI then, and is determined to exterminate the vast majority of the human race today — lest they lose their position as ruler of the universe. One critical problem we face, LaRouche stressed again last night, is that even our best allies in fighting against the British-Obama drive toward thermonuclear war, especially the military, do not understand the nature of the enemy. We are dealing with a species so devoted to preserving the oligarchical principle, that they are willing to die rather than cede control — while bringing the rest of us down with them. They expressed that intent in killing the SDI, and rammed their policy through with even a large portion of the American population, as today, which accommodated to their policy. Ironically, some leading Russians who were manipulated by the British in the 1970s and '80s have learned their lesson — as we see in the SDE proposal, and the Russian Defense Minister's March 22 invocation of weaponry based on "new physical principles" such as "directed-energy weapons," "wave-energy weapons," and the like. But to accomplish this aim, the British oligarchy, and their leading Obama puppet, must be destroyed. Rule No. One: there can be no business as usual. Despite the determination of the U.S. military to prevent a war, we still stand on the brink. The real danger point we can anticipate would come at the point after the Israelis had launched a strike against Iran. How will British puppet Obama respond? The only guarantee that he won't detonate general war, is to remove him from office — because general war in the current period, even more intensely than in 1977, inexorably leads to the ultimate extinction, thermonuclear war that wipes out the bulk of the human race. What is required is a new conception of statecraft, one in which mankind governs his behavior by new rules which proceed from a conception of man as a thinking being, expressing in a willful manner the creativity of the universe and its Creator. In addressing this question last night, LaRouche emphasized that such a conception will still be based on nation states, but those states must come to new global agreements based on multigenerational projects (like NAWAPA). The dominant feature of such projects will be not only their role in upgrading the level of energy-flux-density and man's power in the universe, but the fact that it will take 20-40 years, or more, for them to be realized. It is only such a policy which will allow mankind to actually survive all the threats of extinction — from the threat of thermonuclear war, to that of a physical-economic New Dark Age, and the perils of galactic change. Under such a policy, nation states can define new protocols for collaboration, and converge around the common aims of mankind. “Expressing the sense of Congress that the use of offensive military force by a President without prior and clear authorization of an Act of Congress constitutes an impeachable high crime and misdemeanor under article II, section 4 of the Constitution. Commenting on this resolution, Lyndon LaRouche said that this is “urgent” and that everyone should go “full steam ahead” with organizing support for it. This comes from a member of Congress with military credentials, which is extremely important in this case. It is to be highly welcomed. “This bill could save the United States from destruction”, LaRouche said. Every Congressman must co-sponsor this resolution, now. Go to your Congressman’s district office, call their staff, attend their town hall meetings, organize overwhelming support for this resolution – such a mass movement against Obama could be the only thing standing between us and World War III. Go to your Congressman’s district office, call their staff, attend their town hall meetings, organize overwhelming support for this resolution -- such a mass movement against Obama could be the only thing standing between us and World War III. Defense Minister: Russia Will Develop Weaponry Based on "New Physical Principles"
Russian Defense Minister Anatoly Serdyukov said at a meeting today with Prime Minister and President-elect Vladimir Putin, that proposals for the development of weaponry based on "new physical principles" would be presented by December 2012. Putin highlighted the need to develop such weapons systems, in his pre-election article on strategic matters. "The development of weaponry based on new physical principles; direct-energy weapons, geophysical weapons, wave-energy weapons, genetic weapons, psychotronic weapons, etc. is part of the state arms procurement program for 2011-2020," Serdyukov stated. The reference to "new physical principles" will be understood as highly relevant by those familiar with the history of Russian and Soviet strategic thinking—as well as Lyndon LaRouche's Strategic Defense Initiative (SDI)  proposal from the late 1970s and early 1980s, which was adopted in 1983 by U.S. President Ronald Reagan. The language comes almost verbatim from the mid-1980s writings of Marshal Nikolai V. Ogarkov, and the ideas of Soviet Armed Forces General Staff strategist Marshal V.D. Sokolovsky, author of the famous Military Strategy book of the early 1960s. As was noted in a Feb. 22 entry on the LPAC web site , Putin is today presenting policies drawn directly from these precedents. Defense Minister Serdyukov, after he and President Medvedev addressed a March 20 conference of the defense sector leadership, had located Russian defense planning in the context of the U.S.-NATO "deployment of the global missile defense [which] considerably violates the power balance and strategic stability as a whole." According to a March 21 wire from Xinhua, "Serdyukov said Russia has already started to study responsive measures that would be made public during an international conference on missile defense in Moscow in May. As for countermeasures, Serdyukov said Moscow would upgrade 10 first-strike missiles of Topol-M and Yars complexes, which account for 25 percent of all current Russian nuclear forces. Russia, meanwhile, plans to put its newest intercontinental ballistic missile, the [upgraded submarine-launched] Bulava, in service in October and build eight nuclear strategic submarines to carry them by 2017. Serdyukov said that between 2008 and 2011 Russia had acquired 39 inter-continental ballistic missiles, 12 Iskander missile systems, two submarines, nine warships and boats, and other weaponry and military equipment." These statements were made in the framework of Serdyukov's review of the 2011 defense program and outline of this year's objectives. The road-mobile Iskander missile is the tactical (short-range) system, which Medvedev previously announced will be deployed in Kaliningrad, between Lithuania and Poland, in the event that NATO proceeds with its ABM plans. The missile-defense conference announced by Serdyukov will be held May 3-4, and will be the occasion for Russian military officials to unveil more of their planned countermeasures. Addressing a Moscow conference entitled "Euro-Atlantic Security Community: Myth or Reality? ", Russian President Dmitri Medvedev drew a number of clear lines on Western policy, which must be established if such a community is to become a reality. The first line drawn, as reflected in the headline of the release by Ria Novosti, was on the NATO BMD system: "Time Running Out for Missile Shield Talks." Medvedev made it clear that no one has given Russia a reason to believe the new European missile defense is not targeted against them, and Russia will be forced to respond to the potential threat if talks don't succeed in the near term. The second line drawn was on what Medvedev called the "psychology of force," the "increase in those wishing to use arms as a means of solving problems." "This is extremely dangerous and an unacceptable tendency," he went on, citing in particular the threats against Syria and Iran, and sounding the alarm about threats by the threateners to use "loopholes" to get around the UN Security Council. Medvedev is scheduled to attend a heads-of-state Nuclear Summit on Monday, where he will have the opportunity to discuss these matters in a number of one-on-one meetings with others, including that British puppet and warmonger, Barack Obama. "In the thermonuclear age, any misjudgment on either side about the intentions of the other could rain more devastation in several hours than has been wrought in all the wars of humanity." Report to the American People on the Berlin Crisis, July 25, 1961. "Today, every inhabitant of this planet must contemplate the day when this planet may no longer be habitable. Every man, woman and child lives under a nuclear sword of Damocles, hanging by the slenderest of threads, capable of being cut at any moment by accident or miscalculation or by madness. The weapons of war must be abolished before they abolish us" Address Before the General Assembly of the United Nations, New York City, September 25, 1961. "I speak of peace because of the new face of war. Total war makes no sense in an age when great powers can maintain large and relatively invulnerable nuclear forces and refuse to surrender without resort to those forces. It makes no sense in an age when a single nuclear weapon contains almost ten times the explosive force delivered by all the allied air forces in the Second World War. It makes no sense in an age when the deadly poisons produced by a nuclear exchange would be carried by wind and water and soil and seed to the far corners of the globe and to generations yet unborn." Commencement Address at American University, June 10, 1963. "A war today or tomorrow, if it led to nuclear war, would not be like any war in history. A full-scale nuclear exchange, lasting less than 60 minutes, with the weapons now in existence, could wipe out more than 300 million Americans, Europeans, and Russians, as well as untold numbers elsewhere. And the survivors, as Chairman Khrushchev warned the Communist Chinese, 'the survivors would envy the dead.' For they would inherit a world so devastated by explosions and poison and fire that today we cannot even conceive of its horrors. So let us try to turn the world away from war. Let us make the most of this opportunity, and every opportunity, to reduce tension, to slow down the perilous nuclear arms race, and to check the world's slide toward final annihilation." "If only one thermonuclear bomb were to be dropped on any American, Russian, or any other city, whether it was launched by accident or design, by a madman or by an enemy, by a large nation or by a small, from any corner of the world, that one bomb could release more destructive power on the inhabitants of that one helpless city than all the bombs dropped in the Second World War." Address to the American People on the Nuclear Test Ban Treaty, July 26, 1963.